How to watch Glastonbury 2014 – on TV, on radio, online and mobile | What Hi-Fi? Not one of the lucky few to have scored tickets to this summer's music festivals? We know the feeling – but it doesn't mean you have to miss out on your favourite acts just because you're at home. 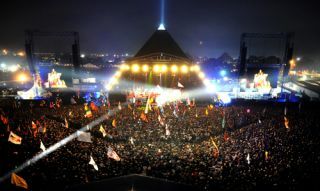 TV: The BBC is host broadcaster of Glastonbury and is sending 300 staff to the iconic Somerset event – that's more than have gone out to Brazil for the World Cup. It'll come as no surprise, therefore, you're not going to miss much of the festivities from Worthy Farm. On TV, there'll be 30 hours of coverage across its four channels – although BBC One's coverage looks as if it's restricted to The One Show, which kicks off the coverage on June 27th (7pm-8pm). After that, it will be BBCs Two, Three and Four taking up the challenge. BBC Two is where the major headliners can be found, with BBC Three offering a "younger perspective" and BBC Four showcasing some highlights from some of the classic acts across the weekend. Smart TV: Red Button services will have additional streams, while the Connected Red Button on TiVo from Virgin – plus a range of recent Sony, Samsung, LG and Panasonic TVs – will also come with the ability to follow live streams and more. Radio: If 30 hours on TV isn't enough, how about more than 50 hours on across four radio stations? It's Radio 1, Radio 1Xtra, Radio 2 and 6 Music that'll be taking you through the weekend, with the latter set to explore the festival's "alternative" side. The BBC Music Teepee will see artists perform exclusive sets for audiences back home too.